Hello to all the Story Empire readers! Today is Book Cover Friday and I get the honor of sharing a cover or two of interest. I tend to lean toward sharing covers from fantasy and science fiction since those are my favorite genres. Today, I’m reaching into the way-back machine and pulling out what was a staple of Ace’s fantasy line from 1966-1977: Conan. These books included both original short stories about the sword and sorcery fiction hero written by Robert E. Howard. During this time, L. Sprague de Camp edited the series of short fiction while he and Lin Carter added a few originals of their own. Back in the day in my late teens, I read through these books which included some classic fantasy tales, which when originally published, were ground-breaking for the pulp genre. Included in Ace’s run with the books were covers of the twelve books done by Frank Fanzetta. The artwork conveyed both the elements of sword and sorcery, usually with plenty of action and some sort of magical element. 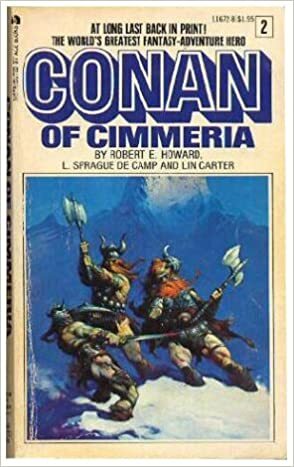 One cover I share today is book 2 in the Ace series, Conan of Cimmeria, which depicts Conan fighting a couple of giants. 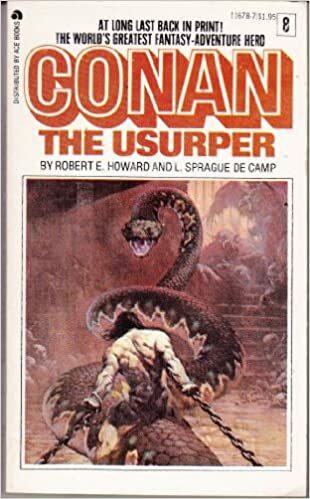 The other is Conan the Usurper which features Conan fighting a huge serpent. Both are based on stories in the books and are excellent examples of artwork clearly conveying the theme of the genre. Thanks for reading today. Please leave your thoughts and share your favorite Conan cover if you have (assuming you’ve read these previously). Otherwise, please share a cover which you feel present fantasy or some other genre accurately. I remember these book covers very well. I’m pretty sure I had copies of both and read both. I was also a Frank Frazetta fan in the day and had some of his framed artwork. Boy do these books bring back memories! Yes, there are some really good Conan stories. The artwork was very distinctive. I have never heard of this series of books. Clearly they never made it to Africa. Thanks for the article, I will look them up. The original stories were written many years ago in the dawn of fantasy writing. Other’s then wrote more stories since they were public domain. It was easy for publisher to get the rights and create an anthology series in the same style. Sword & sorcery covers from way-back featured today on Story Empire. I love Frazetta art, along with Vallejo and now his wife. I devoured these Conan stories knowing all along they were pulp. I had a bad habit of discarding paperbacks. When it’s my turn to share, I’m going to have trouble finding anything on my bookshelf that fills the mission. Yes, these are complete pulp but they were entertaining and sold a lot of books. The covers for that particular set of editions were classic representations. By a world renowned artist of his day. Started his career on Lil’ Abner. He was everywhere, and even did a Chevy Chase poster for the Vacation movie. I guess these are more appealing for those who remember them … the nostalgia value. For me, they wouldn’t draw me to the books these days, lols. I’ve never read Conan, and so these are my first intro to these. You’re correct, these are not going to reach the widest audience but they were quite popular at the time. They are dated but what I would expect something similar from a true sword & sorcery book these days. Hmm… can’t say I’d have picked these up because the covers compelled me. But then again, I’m not the target audience. Interesting to see your selections. I wouldn’t say I’m the target audience anymore but there are several Conan stories that are very good examples of sword and sorcery. Howard told some good tales and the cover Ace chose were illustrative of the sub-genre. Thanks for the reblog today, Staci. Always loved the Conan covers. I remember stumbling onto them when I was a kid collecting Boris Vallejo and Julie Bell cards. They really told you what kind of story you were walking into. They were excellent depictions of the genre. Vallejo was another artist from that time I remember well. Thanks for the comment today. You’re welcome. I’ve wondered if Vallejo and Bell are still around. I haven’t checked but I should. As I remember, they had books of fantasy artwork released in the 80’s. They were popular in the 90’s too. Seeing that they did a lot of chainmail bikini stuff, I wouldn’t be surprised if they fell out of style. Yes, those weren’t realistic at all. Funny thing is that I never thought they were supposed to be realistic. I believe Julie Bell (Mrs. Vallejo) is still painting. I regularly surf for art in various genres and find it occasionally. Looks like they’re both still working. I had no idea Julie Bell was a former bodybuilder. Probably, but that would be an awesome thing to see. Hey, you can dream. Bet it would be outstanding though!